The NSW Government needs to stop turning a blind eye to the cruel sport of greyhound racing and end it, writes Emma Hurst. WHEN THE NEW SOUTH WALES Government backtracked on its plans to introduce a greyhound racing ban, most people were dismayed that thousands of dogs would continue to suffer in an abusive and unjustifiable industry in which cruelty – including the mass slaughter of healthy dogs – is a business model for "success". Now, just days after RSPCA inspectors found a mass greyhound grave in Western Sydney, the NSW Government has announced that it will give the industry $500,000 for a racing prize. The only condition is that the owner who wins must not kill the winning dog — other than that, it's dirty business as usual. The decision to throw public funds at this vile "sport" plumbs new depths. There are no regulations that can create humane conditions for greyhounds born into a cruel industry in which profit comes before their welfare. The very culture of greyhound racing is defined by the acceptance that thousands of dogs will be killed just because they aren't profitable. It's time that New South Wales brought in the ban and finally put a stop to this abusive practice rather than helping to prop it up. Greyhound racers treat highly social, sensitive dogs like machines, sentencing them to life in a cramped cage or kennel when they're not being forced to race. Many dogs die as a result of illness and injuries, including broken legs, heatstroke and heart attacks. An estimated 18,000 greyhounds, 8,000 of whom are puppies, are killed by the industry every year in Australia simply because they're deemed too slow to win races. The "careers" of those selected for racing usually last only a year or two and most are "retired" – or more accurately, discarded – when they're between two and four years old. Two years ago, Mike Baird, then New South Wales Premier, announced the state would ban greyhound racing, effective 1 July 2017, after an ABC Four Corners exposé revealed that some of Australia's highest-profile greyhound trainers used live animals – including piglets, rabbits, and possums – to train dogs. A subsequent State Government inquiry found evidence of systematic cruelty to animals, including the mass killing of dogs considered too slow to pay their way. Disgracefully, Baird ultimately flip-flopped into the laps of a few privileged industry bullies. Despite Baird's backflip, the writing is on the wall. 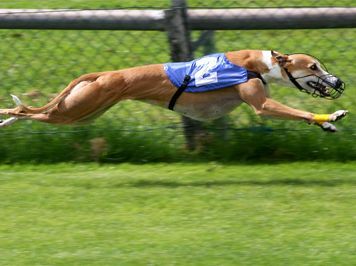 In the last few years, we've seen the closure of the last greyhound racing track in London and in 40 U.S. states, commercial dog racing is now illegal. Closer to home, approximately 19 tracks were slated for closure by Greyhound Racing NSW long before the Premier ever uttered a word about a ban. Today, we look to Gladys Berejiklian to achieve what her predecessor was too cowardly to do. Until this barbaric and bloody business is outlawed, more and more dogs will lose their lives — we owe it to "man's best friend" to ensure that it happens sooner rather than later. Emma Hurst is a registered psychologist and the Media Officer at People for the Ethical Treatment of Animals Australia (PETA).